A Diving Board is used for diving and is a board that is itself a spring, i.e. a linear flex-spring, of the cantilever type.Springboards are commonly fixed by a hinge at one end (so they can be flipped up when not in use), and the other end usually hangs over a swimming pool, with a point midway between the hinge and the end resting on an adjustable fulcrum.Potent’s Diving board are made up of fiber and have Burma wood inside. The special design has an anti-slippery surface. 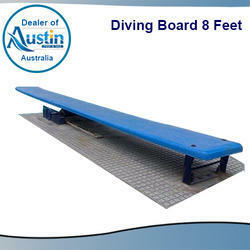 Diving Boards are 5mx0.5m wide and 45-65 mm thickness. The board is fixed on a Fulcrum made up of MS/ss-034 Safety of the diver is the key feature of our diving boards . Fulcrum for Diving Board - fulcrum is made up of MS/SS channel and track with width of 550 mm and rollerof 500 mm wide with handle or move to and fro. the clamp is provided at the back for holding the board. A Diving Board is used for diving and is a board that is itself a spring, i.e. a linear flex-spring, of the cantilever type.Springboards are commonly fixed by a hinge at one end (so they can be flipped up when not in use), and the other end usually hangs over a swimming pool, with a point midway between the hinge and the end resting on an adjustable fulcrum.Potent’s Diving board are made up of fiber and have Burma wood inside. The special design has an anti-slippery surface.The board is fixed on a Fulcrum made up of MS/ss-034 Safety of the diver is the key feature of our diving boards . Fulcrum for Diving Board - fulcrum is made up of MS/SS channel and track with width of 550 mm and roller of 500 mm wide with handle or move to and fro. the clamp is provided at the back for holding the board. 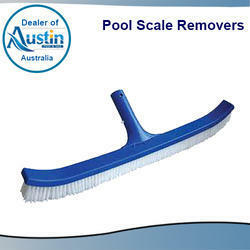 With the constant support of our expert team, we are engaged in presenting a wide assortment of Pool Scale Removers. Looking for Swimming Pool Diving Board ?